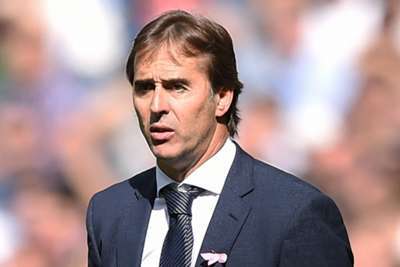 Julen Lopetegui insists he is only focused on preparing Real Madrid to face Viktoria Plzen and not on the speculation that he will be sacked as head coach. Widespread reports over the last 24 hours have suggested the former Spain boss could be dismissed before this week's Champions League clash with Plzen, or at least prior to the Clasico on Sunday. But although he refused to speculate on what will happen in the coming weeks, Lopetegui stressed on Monday that he is only interested in masterminding a win at the Santiago Bernabeu against the visitors from the Czech Republic. "I'm not thinking about anything other than the game [on Tuesday]," he told reporters. "If you're hoping to see a dejected coach, don't look at me, because I'm excited to play the game and to win. "We're aware that we haven't been getting good results and we only think about moving on from this moment. To fight is in the DNA of the club and that's what I have learned here. "I don't know what will happen in a month or in a year. Right now, I'm dressed and sitting here in front of you." In the aftermath of Madrid's home defeat against Levante on Saturday – their first match since back-to-back 1-0 losses to CSKA Moscow and Deportivo Alaves – speculation has been rife over who could be chosen to succeed Lopetegui. Former Chelsea boss Antonio Conte and current Real Madrid Castilla coach Santi Solari are among the names being linked with the job, but Lopetegui is paying no attention to the reports. "I'm not aware of the news and I don't believe this is an important factor," he said. "If I had seen it, I wouldn't be a coach, much less the coach of Real Madrid. "This is a champion team. They know what they have to do and I'm absolutely certain that we're going to play a great game. I have no doubt."